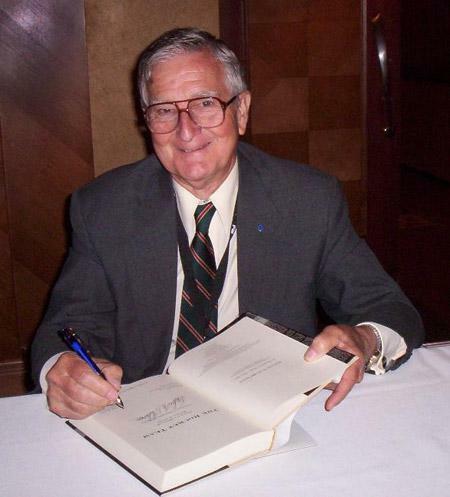 Frederick Ira Ordway III was an educator, consultant, researcher, and author on space flight and energy programs. His career began in various geological and engineering positions for Mene Grande Oil Company in San Tome, Venezuela in 1949. Five years later he was in the guided missiles division of the Republic Aviation Corporation. Throughout the 1950’s and 60’s he held positions with the General Aeronautics Research Corporation, the National Research and Development Corporation, and Saturn Systems office at the Army Ballistic Missile Agency in Huntsville. It was in Texas, where he developed an association with Wernher von Braun. From 1960-64 he was Chief of Space Information Systems at NASA Marshall Space Flight Center. Next came a period of consulting: 1965-66 for Paramount Pictures The Adventurer’s; and 1968-69 for the Encyclopedia Britannica, the American College Dictionary of the English Language, and Stanley Kubrick at MGM for 2001: A Space Odyssey. Throughout the 1970’s he was in various positions at the Department of Energy; 1975-77 he was Assistant to the Administrator of ERDA and 1977-1994 Policy and International Affairs director in the special projects office. Ordway was the author of numerous books including Visions of Spaceflight: Images from the Ordway Collection, The Rocket Team: From the V-2 to the Saturn Moon Rocket, and (with Wernher von Braun) History of Rocketry and Space Travel. Ordway was the recipient of the 2012 National Space Society Space Pioneer Award for a Lifetime of Service to the Space Community as well as the recipient of the Arthur C. Clarke Award for Lifetime Achievement.